Chocolate fountains, chocolate for chocolate fountains and fondue chocolate are Sephra’s hallmark products. Take advantage of buying directly from Sephra, the manufacturer. Sephra chocolate fountains are the highest quality chocolate fountains available anywhere in the world. Chocolate fountains used by our commercial chocolate fountain customers, generate thousands of dollars in revenue and increase guest satisfaction immensely. Whether you are a full service hotel, caterer, buffet restaurant, casino, reception center or party rental company, a Sephra commercial chocolate fountain will be a great addition to the profitability of your business. Removable basin: Facilitates ease of use and cleaning. Our patented Quick Set tier system: This patented design feature allows for the tiers to be simply slid over the center column and set on the specified location without the use of tools or rubber bands which all of our competitors use. Light weight: The fountain bases are light weight for ease in transporting. Direct Drive Motor: No belts to adjust or break. Heavy Duty Carrying Cases: Each chocolate fountain comes with its own heavy duty carrying case for ease of transporting the chocolate fountain. Electrically and Sanitation Certified: ONLY Sephra chocolate fountains have passed certifications to meet health department requirements. Melt chocolate in the bowl: Yes, you can melt your chocolate fountain chocolate directly in the bowl of your Sephra chocolate fountain. Only Sephra has these certifications. Sephra Chocolate Fountains for commercial use are the only chocolate fountains which have been actually sanitation and electrically tested and certified by international certification agencies. This is extremely important. The last thing you want as a professional business is to not comply with your local county health department requirements for health and sanitation. We have developed four models of chocolate fountains for commercial use. Each chocolate fountain is designed to meet the unique requirements of different venues and group sizes. The following is a brief overview of each of our commercial chocolate fountains. The Sephra Chocolate Fountain: The Sephra Chocolate fountain is the tallest and most impressive in our range of chocolate fountains. Its’ height of 44 inches and four tier levels deliver a very dramatic visual presentation. It will bring out the “Wow” factor you want to create at any special event or gathering. It has a maximum chocolate capacity in the bowl of 20 lbs. and will operate and deliver a full curtain of chocolate with only 14 lbs. The Sephra Chocolate Fountain is the perfect addition to any large buffet to keep your guests coming back. The Montezuma Chocolate Fountain: The Montezuma Chocolate Fountain is our 34 inch, three tier chocolate fountain. Ideal for events of all sizes, the Montezuma assures a grand presentation which will impress every guest. This chocolate fountain uses the same base as the Sephra 44 inch chocolate fountain which holds a maximum of 20 lbs. of chocolate. It can operate efficiently with as little as 12 lbs. of chocolate. The Aztec Chocolate Fountain: The Aztec Chocolate Fountain is a must for all caterers and chocolate fountain owners. It is the ideal chocolate fountain for smaller events such as bridal showers, birthday parties, graduation parties etc. Its’ elegant style and appealing design make it suitable for any special occasion. It is the perfect chocolate fountain to start with as you grow and expand your catering and chocolate fountain business. The maximum chocolate capacity of the Aztec Chocolate Fountain is 12 lbs. and it requires only 6 lbs. of chocolate to deliver the full curtain of chocolate. The Cortez Chocolate Fountain: The Cortez Chocolate Fountain is the smallest Sephra commercial chocolate fountain standing at 23 inches tall. It is the perfect size for portability and is contained in one single heavy duty case. It is often used as an accent chocolate fountain to add variety to the catered offering at large events. Caterers will frequently use different types of chocolate in one or two Cortez chocolate fountains or color white chocolate different colors and use the larger 44 inch chocolate fountain or 34 inch chocolate fountain as the main display. The Cortez chocolate fountain is very versatile and is terrific when creating a multi-chocolate fountain display for your guests. PROFITABILITY: A Sephra chocolate Fountain requires less chocolate to run, less staff to operate and is sure to increase your bookings and per capita revenue. What does this bring to your business? Increased revenue and net profits! EASE OF USE: Every aspect of a Sephra chocolate fountain has been designed to provide Ease of Use. – Quick Set Tier System – Removable Basin – Light Weight – Melt chocolate directly in the chocolate fountain basin – Easy to clean – Easy to transport and store. What does this bring to your business? Staff Efficiency and lower costs! RELIABILITY:“Built to Last”-- Only Sephra chocolate fountains have undergone the rigors of inspection and testing by industry electrical and sanitation certification agencies. Each chocolate fountain is backed by a limited lifetime warranty. What does this bring to your business? Peace of Mind! this much money from something this delicious! We understand your success is our success. We are committed to providing you an exceptional experience with Sephra products. We want you to gladly tell your associates and friends about us. Our trained and knowledgeable staff members are well acquainted with every aspect of operating and maintaining your Sephra Chocolate Fountain. Please call on us for ideas or should you need assistance with you Sephra Chocolate Fountain in any way. We offer free advertising on our website in our Chocolate Fountain Rental Directory. This is an excellent resource for you to use in promoting your chocolate fountain business. The Chocolate Fountain Rental Directory is accessible directly from our home page and many people looking to rent a chocolate fountain visit our site and search the chocolate fountain providers in their area. We encourage you to take advantage of the chocolate fountain rental directory. Within the directory there are also opportunities to give your business additional exposure by purchasing a display ad. Please visit the chocolate fountain rental directory to learn more about these advertising opportunities. Our talented team of engineers is dedicated to create the finest chocolate fountains in the world. We are continuously designing and improving our chocolate fountain products to serve you better. Our determination to create the world’s finest chocolate fountain has made Sephra the pioneer in the innovation of the chocolate fountain. We are proud of the four patents which have been issued to Sephra for innovations to the chocolate fountain. These patented unique design features, are standard on all of our chocolate fountain machines. Because of our patents our competitors must use rubber bands to support their tiers on the center column versus our simple Quick Set-Drop in place tiers which make setting up and taking down the chocolate fountain so quick and easy. Sephra chocolate fountains truly do set the standard of quality and reliability in the industry. 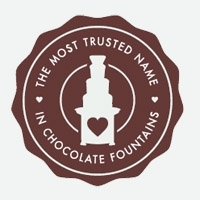 We stand behind the quality of our Sephra Chocolate Fountains 100%, which is why we are the only chocolate fountain manufacturer which has gone to the effort and cost to have our chocolate fountains electrically certified and sanitation certified by internationally recognized certification agencies. No other chocolate fountain product in the world has met these high standards! We are pleased to deliver to our chocolate fountain customers a limited lifetime warranty on every commercial chocolate fountain we make. Thank you for your interest in Sephra Chocolate Fountains and our Sephra Chocolate for Chocolate Fountains. You deserve the very best. We look forward to serving you !